Whether you’re looking for classic table games, slot machines or live entertainment, Wild Horse Pass Gila River Casino is a must-visit experience for nightlife in City Limitless®. Located just a short drive from Mesa at the Gila River Indian Community, Wild Horse Pass Gila River Casino is a great way to keep enjoying City Limitless® after the sun sets. 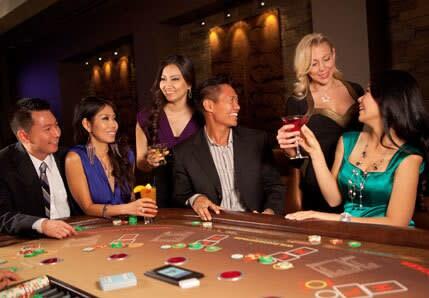 If you’re looking to go beyond the thrill of high-stakes gaming, here’s our tip: Wild Horse Pass Gila River Casino has an amazing vibe when it comes to nightlife. The Ovations LIVE! Showroom theater offers unforgettable experiences featuring live music and comedy. Pat Benatar, Neil Giraldo, Boyz II Men and Sara Evans are just a few of the names that are gracing the Wild Horse Pass stage in 2016. At the Lounge, you can take a seat and enjoy spectacular cocktails and food, too. Chrome Nightclub offers an elevated entertainment option featuring live DJs spinning the hottest hits and an ultra-cool crowd until last call. If you’re looking to test your luck, you can showcase your poker skills or play one of the other 70+ Vegas-style table games or 1,000+ slot machines at Wild Horse Pass Gila River Casino. Once you’ve collected your winnings, head over to nearby Phoenix Premium Outlets where you’ll find impressive savings on your favorite brands including Coach, Kate Spade New York, Adidas, Michael Kors and more. If you don’t strike it rich at the casino, you can always head over to Rawhide Western Town with the entire family and do some gold panning, which is a little less high-stakes. While you’re there, dine at their award-winning family destination steakhouse or experience a thrilling live action stunt show at Six Gun Theater. The probability is high that you’ll at least hit the ‘fun jackpot’ at Wild Horse Pass Gila River Casino! Whether you enjoy poker with your pals or enjoy the after-sunset experience, share the fun you have using #MesaCityLimitless in your posts.